Many of these articles have been published in the Mendocino Beacon’s Kelley House Calendar. The Kelley House Museum is an ocean-view house museum in the heart of the historic district of Mendocino, California. Its mission is to collect, preserve, protect and share the rich history of the Mendocino Coast. It houses the only museum-quality storage and research facility open to visitors on the Mendocino California Coast. After clicking the Donate button, we invite you to click the box labeled Share my mailing address with Kelley House Museum. Kelley House Museum, Inc. is a 501(c)3. Your donation may be tax deductible, as allowed by law. The mission of The Kelley House Museum is to collect, preserve, protect and share the rich history of the Mendocino Coast. 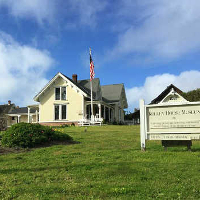 Founded in 1973, it serves this mission in two ways: the historic house museum is open to visitors four days a week; in addition, the building houses the only museum-quality storage and research facility on the Mendocino Coast. The Museum provides online access to thousands of artifacts, photographs and documents. Genealogy and photograph requests arrive from all parts of the world. Copyright © 2019 The Kelley House Museum. All Rights Reserved.